Steven Okazaki's Oscar®-nominated documentary short The Conscience of Nhem En is profoundly distressing for reminding that Hannah Arendt's conception of the "banality of evil" is as global a phenomenon as it is a human one and no less a threat in the machinations of warfare today as yesterday. Our's is the constant task to remember and resist such inhumanity. Arendt's understanding of the complicity that supports man's officious inhumanity to man aligns with filmmaker Okazaki's thematic concerns with the extraordinary lives of ordinary people. When he and I spoke on the occasion of his Emmy®-award winning White Light, Black Rain, Okazaki expressed his upset with a historicity that excludes the testimonials of survivors of horrific events; an exclusion he deemed "disturbing" if not "racist." Such exclusions avoid the fascinating and tragic human story and—for his part—talking about survivors and allowing survivors to speak for themselves is "more of a rebellious act" against systemic historical erasure; a rebellion made all the more essential in the face of a younger generation of Cambodians remaining uninformed about these relatively recent events. Admittedly not a political creature, Okazaki achieves an intimate view of the past through individual experience by stressing—as he says—the story rather than the message. Allowing individuals to tell their stories, he asserts, is itself a political act. Along with Smile Pinki, Megan Mylan's Oscar®-winning documentary short, The Conscience of Nhem En will screen FREE this evening, Tuesday, July 7 at the Jewish Community Center in Berkeley followed by a discussion with Steven Okazaki. The Jewish Community Center is located at 1414 Walnut Street, Berkeley, California. Doors open at 6:30PM, followed by the screening at 7:00PM, filmmaker discussion at 8:15PM and a dessert reception at 8:45. Those interested should RSVP at https://www.homeboxoffice.com/rsvp/oscarshorts or phone 888.684.0385. For those unable to attend this community outreach event, The Conscience of Nhem En debuts July 8 at 8:00PM on HBO2. Other HBO2 playdates: July 13 (5:30PM), 18 (10:00AM), 21 (8:30AM), 23 (noon), 26 (6:00AM) and 30 (3:30PM). All listings EST. As synopsized in the film's press release, the United States carried out covert bombings of Cambodia during the Vietnam War, contributing to the rise of Pol Pot, leader of the Khmer Rouge, which sent nearly the entire population of the country into forced labor camps and was ultimately responsible for the deaths of 1.7 million people. In the capital city of Phnom Penh, men, women and children were sent to Tuol Sleng Prison, also known as S-21. Upon arrival, prisoners were registered and photographed, usually seated with hands tied behind their backs. They were then tortured and interrogated about their involvement with United States or Russian intelligence organizations before they were killed. The photographs of Tuol Sleng are an extraordinary document of madness and cruelty. In many cases, the prisoners were just opening their eyes, after a blindfold or hood was taken off, when the photographs were taken. In the photographs, some appear oblivious to what is about to happen, reflexively smiling for the camera, but most seem very aware they are facing their death. 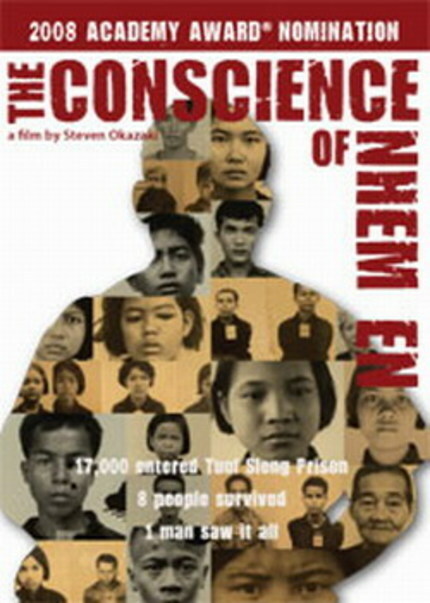 The Conscience of Nhem En explores issues of conscience and complicity. A witness in the subsequent war crimes trials was Nhem En, a 16-year-old Khmer Rouge soldier who took about 6,000 of the photographs in 1977 and 1978. He speaks about his involvement with the killings, observing impassively, "People do what they have to do to survive. I guess it's a matter of conscience. The photographer's job is to take photographs. There was no choice. What was the choice? To die?" He feels he should get credit for documenting a human side to the genocide, saying, "If I hadn't taken those photos, if it weren't for me, no one would know or care about Cambodia." Despite his angry protestations, the film reveals what appears to be a disturbing lack of remorse felt by Nhem En, who charges himself only with obeying orders. Of the thousands of men, women, children, even infants, that Nhem En photographed, he did not aid or utter a single word of solace or kindness to any of them. Approximately 17,000 died at S-21, and only eight prisoners are known to have left the facility alive. Mixing interviews, on-location footage and vintage photographs, The Conscience of Nhem En tells the remarkable stories of three S-21 survivors: Bou Meng, 34 years old at the time, survived because the prison needed an artist to paint portraits of Khmer Rouge leader Pol Pot; Chum Mey, 42 at the time, survived because he could fix sewing machines; and Chim Math, 20 years old, doesn't know why she survived, but she can't forget what happened to her. Not only are their testimonials of survival equally humanist and political, but Okazaki accomplishes a masterful counterpoint of filming modern-day portraits of living Cambodians to contrast against Nhem En's official death portraits. Today, nearly every family in Cambodia can claim to have lost a close relative to the Khmer Rouge. An intimate look at the country's ongoing struggle to rise above the past, The Conscience of Nhem En highlights a troubling fact about Cambodia today: Many of the people who carried out these crimes remain unpunished and unrepentant. Steven Okazaki's previous HBO films include the Emmy®-nominated Black Tar Heroin; Rehab; The Mushroom Club (Oscar® nominee for Best Documentary Short); and the Emmy® winner White Light/Black Rain: The Destruction of Hiroshima and Nagasaki. Among his other credits are Unfinished Business (Oscar® nominee for Best Documentary Feature) and Days of Waiting (Peabody winner and Oscar® winner for Best Documentary Short). Wikipedia entry on the "banality of evil"